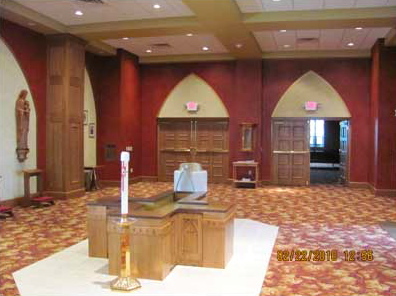 Sacred Heart Catholic Church in McCartyville, OH, added on $2.5 million extension to their existing building to accommodate their growing parish. After many meetings with contractors and trustees to discuss details and study blueprints, we were able to put together a color design scheme for the beautiful space. The main obstacle I had noticed on the blueprint was the numerous harsh angles. Verticals, horizontals, and X’s were everywhere from windows, pews, ceiling joists, and grid work. The only softened edges were on a 25 ft tall, free standing wall at the front where the cross would be placed. 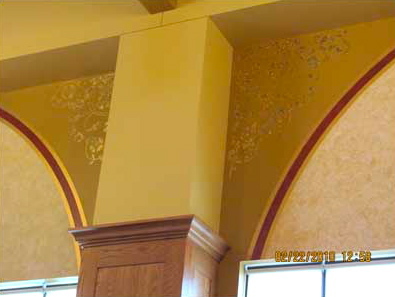 My intention was to repeat this curved arch with painted arches in each window surround. It turned out to be lovely! I then suggested a carpet with a large, flowing leaf and scroll pattern to soften the linear activity. It also turned out to be lovely in a predominately red, but multi color complex arrangement to compliment the stain color we chose for the wood trim and pews. Arched designs soften the harsh angles, and repeat throughout the church for continuity. I chose warm, rich tones for the ceilings and walls, with accents of metallic gold. Talented parish members spent countless hours and days making the vision become a reality with textured light, neutral faux inside the arches, bold leathered faux in deep reds, and metallic gold striping for definition and formality. Stained glass windows were not in the plan of the new addition. In realizing the absence of pattern and color that would be missed by this, I suggested the scrolled, corner designs for stencils to highlight each window. Stencil artist Katy Mielke found the iridescent paints that were used to not only tie in the other metallic accents, but appear multi-colored when viewed from an angle. over in a faux finish of deeper reds and metallic gold. On this special project, I chose colors and patterns to be bold, dramatic, timeless, and to complement the stain on the pews and woodwork. I am especially proud of the results and I’d like to say special thanks to Bud Hoying for getting me involved. Many artists along with volunteers from this parish poured day after day into producing a beautiful place to worship.